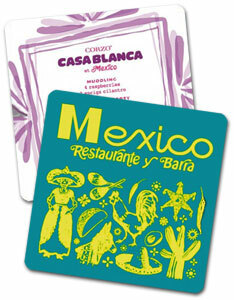 Bar Coasters Are the Perfect Way to Promote Your Bar. Would you like a high-impact way to advertise and brand your bar? Bar coasters are a great way to get word out about your bar. Show your patrons you care and that you're here to stay with customized coasters that have your logo on them, Beer companies have been using bar coasters for decades and with good reason. Why not tap into the success that bar coasters can generate? Advertise your drink and food menus. Promote special upcoming events like band performances, karaoke, pool tournaments, ladies night and other scheduled activities. Put your logo and bar information on the front, and event information on the back. Boost your brand awareness and gain respect by showing your bar logo prominently. Put your address and/or phone number on your coasters so that your patrons can share it with friends. Great for fresh events and promotions, bar coasters are recyclable and can feature new promotions every month!